How Do You Install Soundproofing Between Townhouses, Apartments and Condos? It’s nice to have neighbors — sometimes. For example, they are great if you lock yourself out in the middle of winter, or if you need someone to watch your home while you vacation in the Caribbean. But as with most things in life, having neighbors has its cons, too — like neighbor noise, for instance, or lack of privacy. There are plenty of ways to minimize sound between homes and through walls, and a lot of them do not require construction or altering the building. So, you might not have to worry about a very unhappy landlord to soundproof your home. The very first thing you’ll need to do is identify where the problem noise is coming from. To do this, turn off all appliances and devices, and walk around your home. Check for noise from neighbors or outside sources. Is the noise inside your home or outside? Is it coming from above or below or between homes? Is the issue a matter of sound quality? If you wish for better sound quality, in say, your family room, that can be an easy fix with the addition of acoustic panels or sound-absorbing products. If the noise is coming from the other side of a wall, like your neighbor’s apartment or condo, you’ll have to consider what you’re allowed to do with your rental property. If permanent changes aren’t okay, your best bet is to try acoustic panels like our art panels or fabric-wrapped panels. If people living below you like to throw parties late into the night while you’re trying to sleep, use carpet to help deaden the sound. If your floors are tile, consider adding padded carpet with Green Glue for drastic noise reduction. If you’re not allowed to alter the flooring at all, just layering rugs can help. Check the vents, too. If noise is traveling through the vents, the best thing you can do is construct a baffle and try to control the sound. Attach the baffle to the ceiling to enclose the vent, or to the floor if the vent is on the floor. As far as the ceiling goes, you likely won’t want to invest a lot of time or money if you’re living in an apartment, and you would need permission to make any permanent changes. In this situation, you won’t be able to completely block noise, but you might consider draping fabric across the ceiling. This will at least help absorb some of the noise upstairs. If you wish to make permanent soundproofing changes in your apartment, condo or townhouse, the best thing you could do is install a drop ceiling and acoustical tile in the room you want to soundproof. Or, you could add a second layer of drywall and soundproofing material between layers, as you would to soundproof a wall. Windows and pipes are other major noise sources when living next to neighbors. 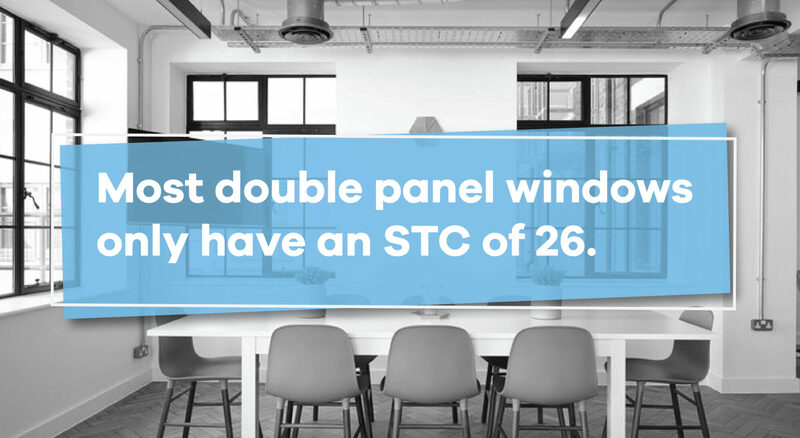 Most double pane windows only have an STC of 26. You might have the option to replace your window with an STC-rated window, but this might not be the most practical. Instead, try applying an acoustical sealant and hang heavy curtains. Wrap noisy ducts with acoustical insulation or replace metal vents with lined vents to help deaden traveling sound. If you’re looking to soundproof your wall between condos, apartments or townhouses, give these methods a try before you pack your bags and move out. Whether you’re a musician looking to pound out a new beat or a cinephile who can’t wait to build your home theater, you appreciate the beauty of both sound and silence. Some of us might not always notice the significant role sound plays in our life, but we do notice sound when it’s too loud or distracting. Imagine preparing a candlelit dinner for two while listening to your neighbor coughing and sneezing every five minutes on the other side of the wall. Or maybe you never minded having a bedroom that faces the street, until you realized the town bus stop is right in front of it. Depending on the circumstances, sound can be a life-changing element. On the bright side, it’s in your power to control sound. We are here to help. Complete our free acoustics analysis to get started, or reach out and let us know what we can do. The members of our herd are happy to solve complex sound problems and improve sound quality for you. Why wait to get started? The Cow is ready to help you get your soundproofing project moooving!